Cecilia Harcourt, the orphaned daughter of the younger brother of a viscount, is desperate to see the novel she has written published. Its publication offers her the only way to escape marriage to her repulsive cousin Percy and also a means to provide medical care for her younger sister. Her maternal uncle and aunt are determined on the marriage in order to claim her small dowry. Cece, as her sister affectionately calls her, is discouraged and worried when the publisher rejects her manuscript, not on the grounds that it is poorly written but because publishing romance is a risk he is not willing to take. But before she can return home to share the bad news with her sister, Cecilia is the victim of a hit-and-run carriage driver. Lieutenant Adam Hunt, recently discharged from the army, is on his way to the home of his oldest brother, military hero Derek Hunt, Duke of Claringdon (hero of The Unexpected Duchess, Playful Brides #1) when he sees the accident. Adam is determined to let his brother know he resents interference in his life and to refuse the money the duke is determined to give him, but that plan takes a back seat to the need to help Cecilia. That help becomes more complicated when the blow to the head Cecilia receives results in amnesia. The doctor assures Adam and the duke and duchess that the memory loss will likely prove temporary, but when her memory returns Cecilia believes she is Lady Magnolia and Adam is the heroic Duke of Loveridge, the lead characters in her rejected novel. What follows is a delightful romp, part farce and part melodrama, that takes some of the most cherished tropes of historical romance—villainous relatives, amnesia, mistaken identity, interrupted wedding, to name a few—and gives them a twist that will leave the reader smiling. This novella that falls between the fourth and fifth novels in Bowman’s Playful Brides series was great fun to read. When the story opened with “And they lived happily ever after,” I expected clever humor, and the story delivered exactly what I expected. My reaction might have been different had I not anticipated the author’s promise of playfulness to be fulfilled. But I did, and it was, and I enjoyed the humor and the wit. The novella should have particularly strong appeal for readers steeped in the conventions of the genre who should enjoy the gentle send-up. Even at fifteen, Lady Alexandra Hobbs, younger daughter of the Duke of Huntley, knew that she would never be as adventurous as her younger brother or as beautiful as her older sister, but she nevertheless aspired to become more like them. But when she observed Lord Owen Monroe, heir to the Earl of Moreland, in a chivalrous moment, he instantly became the hero of heart. From that moment, Alexandra’s greatest aspiration became to marry Lord Owen. Alexandra’s belief in the heroic nature of Lord Owen Monroe was unique. The rest of their world saw him as rogue whose primary interests were drinking, gambling, and womanizing. Owen seemed bent on reinforcing that opinion. If some of his activities challenged that view, he was careful that such actions remained secret. He was content to live down to his father’s opinion of him. However, the consequences of such behavior was his father’s announcement that it was time for his heir to settle down and marry, and the proper wife in the earl’s opinion was Lady Lavinia Hobbs, older daughter of the earl’s friend the Duke of Huntley. Although the two fathers have agreed that the marriage should take place, the duke has added the proviso that Owen must win Lavinia’s consent. Owen has no interest in proper young ladies, but he has a major interest in seeing that his allowance continues to flow from the ducal coffers—and his father makes clear that the unimpeded flow of said allowance is contingent upon Owen’s successfully wooing Lavinia. Owen, accustomed to effortlessly charming any lady he chooses, hits a snag with Lavinia from the start. First, he confuses the identity of the Hobbs sisters and asks Alexandra to dance. Then he finds Lavinia, who has a reputation for being “difficult,” immune to his charm. When Alexandra offers to teach Owen how to win Lavinia in exchange for his help in making Alexandra a belle, he eagerly accepts. Alexandra, once she is convinced Lavinia truly has no interest in Owen, turns her considerable gifts to seeing that it is the rogue rather than the shrew who is tamed in this exchange. But will even true love be able to thwart the marriage plans a duke and an earl have for their eldest offspring? The Untamed Earl is the fifth book in Valerie Bowman’s Playful Brides series. Like the other novels in the series, this one is inspired by a classic. This time, appropriately for an April release, it is Shakespeare’s The Taming of the Shew. I’m a fan of smart romance, and I have read all of the books in this series with delight at Bowman’s wit and clever twists of classic tales. I confess that the third book, The Unlikely Lady, inspired by my second favorite Shakespeare comedy, Much Ado About Nothing, and featuring a bluestocking heroine (a trope I love), is my favorite in the series. My feelings about a romance based on The Taming of the Shrew, a play I dislike, were less than enthusiastic. But I thoroughly enjoyed this story. Owen is an amusing hero who charms the reader even if he fails with Lavinia, but it is Alexandra who steals the reader’s heart. Her vulnerability and awkwardness are endearing, her heart is pure despite her deception, and she actively pursues her dream. I adored her! I’m also a series addict who loved seeing characters from earlier books make appearances. (Owen is the older brother of the Countess of Swifdon, née Lady Cassandra Monroe, heroine of The Accidental Countess, the second book in the series). If you are a reader who demands historical depth and serious angst in your romance, this book is not for you. 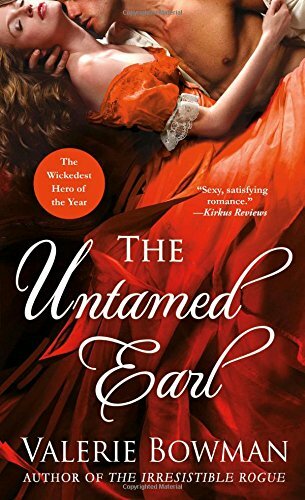 On the other hand, if, like me, you have room on your bookshelves for engaging romps with captivating characters and deliciously satisfying HEAs, I definitely recommend The Untamed Earl—and don’t be surprised if you find reading it is followed by a search for the rest of the series. I already have The Legendary Lord (a November 1 release inspired by Pygmalion—oh, joy!) on my book calendar, and at least four more books in the series will follow. I can’t wait to see what the inspiration for these will be. This sounds perfect for me - thanks!! Read An Unforgettable Hero and loved it! Thanks, Janga! I've read - and enjoyed - both! I'm looking forward to reading these! I'm with you PJ on the content of books. It doesn't have to be historically correct for me to enjoy it. Congratulations to Val on her new release. I loved both of these and cannot wait for more from Valerie Bowman. She has quickly become a very favorite author of mine.